Το SCIA Engineer 16 φέρνει ένα πολύ μεγάλο αριθμό νέων στοιχείων και βελτιώσεων, που εκτείνονται σε όλο το φάσμα της διαδικασίας που ακολουθεί ο μηχανικός για την παραγωγή μίας μελέτης. Μερικές από αυτές αφορούν συγκεκριμένα είδη κατασκευών, και άλλα απλά κάνουν την καθημερινή εργασία του δομοστατικού μηχανικού πολύ πιο εύκολη. Οι βελτιώσεις βρίσκονται σε όλες τις φάσεις της διαδικασίας μίας μελέτης: την αρχική μοντελοποιήση, την ανάλυση, τους κανονιστικούς ελέγχους και το τεύχος υπολογισμών, και όλες έχουν ένα κοινό στόχο: την ΕΥΧΑΡΙΣΤΗΣΗ ΤΟΥ ΧΡΗΣΤΗ. Διάφορες βελτιώσεις στο πλέγμα πεπερασμένων στοιχείων και σε προχωρημένες αναλύσεις. The scaffolding coupler library of SCIA Engineer has been extended with the Layer Allround LW type. Code-checks for scaffolding take into account all specific coefficients and design procedures for this particular coupler. A table of unit stresses (per fibre) in the Cross-section Library has been extended with values for unit warping and unit torsion. A new summary output is now available alongside the brief and detailed reports. A new output for splice connections includes more details. Optimised algorithms results in faster connection checks. Calculations related to Beam Flange And Web In Compression are also faster and provide clearer output. Moment-stiff end-plate connections with four bolts per row are now theoretically better understood. In order to offer a safe verification technique for such connections, SCIA has synthesised the findings of several scientific publications. The implemented connection check is based on the component method and is in full agreement with EN 1993-1-8. The update of connection stiffness has been improved through several modifications and extensions of the algorithm, e.g. both the positive and the negative branches of the moment-rotation graph are generated. SCIA Engineer newly supports weak-axis bending moments and related shear forces. Consequently, strong-axis moment connections can be subject to strong- and weak-axis bending simultaneously. 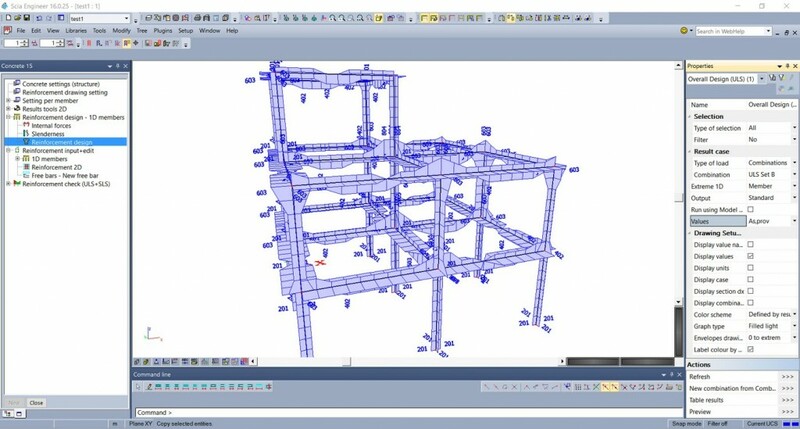 The virtual joist functionality within SCIA Engineer delivers capabilities that span the gap between traditional design procedures used by engineers and detailed analysis done by manufacturers. As a result, users can optimize structures with complex geometry and loading conditions, while also providing joist designations that are in line with today’s standards. An initial member is selected from the virtual joist available in the profile library. The linear calculation and unity check are executed. AutoDesign can be optionally started to selects criteria for which the joist should be optimized: depth, weight, or moment of inertia. The model is updated based on the recommended optimal joist size and the analysis is repeated. The required design method must be specified (ASD or LRFD). 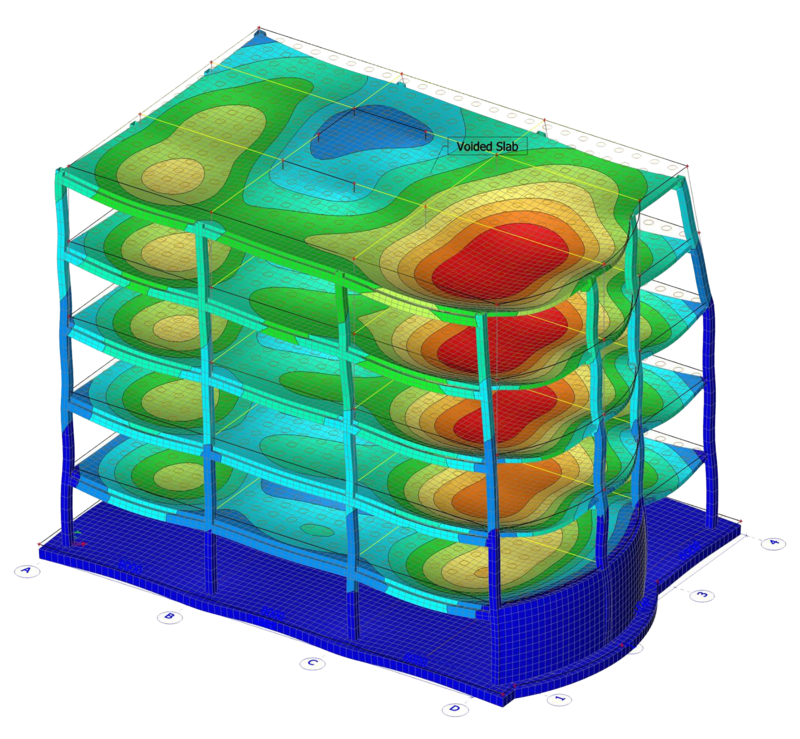 SCIA Engineer 16 features a comprehensive solution for the modelling, analysis and design of composite beam floor systems. evaluation of the contribution of variable loads to the final deflections obtained in the FEM calculations, which means that all required deflection checks can now be performed. SCIA Engineer 16 offers also solution for the modelling, analysis and design of composite beam floor systems according to the U.S. codes. AutoDesign optimizes the structure considering the following four limit states: ULS (Ultimate Limit state) and SLS (Serviceability Limit State) unity checks in the construction stage, ULS and SLS unity checks in the final stage. The general plasticity module, which includes Von Mises yield condition, has been extended with new types: Tresca yield condition, Mohr-Coulomb condition, and Drucker-Prager yield condition. New parameters in the Solver setup increase the stability of non-linear analysis, allow the user to neglect masses in a specific direction and choose a preferable method for the time history analysis. The option to specify the thickness of loose layer at contact level improves the stability of the Soil-in calculation. Triangular elements are now used for the analysis of membranes, if necessary. The algorithm automatically selects the best suitable type of the element. A new possibility for seismic calculation has been implemented – Equivalent Lateral Forces (ELF). It is the most well known method for the seismic analysis of structures. Although it is quite conservative, its simplicity makes it very popular for seismic design. The 3D stress has been extended with 2D strains. It is now possible to see and evaluate basic total strain, principal total strain, basic plastic strain, and principal plastic strain. The display of 3D stress results now also handles the situation when the load is not applied in the shear centre but in the centroid. For uniaxial symmetric cross-sections (mostly steel sections C, U) the position of the shear centre differs from the location of the centroid and this eccentricity causes additional torsional moment. The evaluation of results for Open Checks or checks in the Concrete 15 menu can be simplified and sped up via a generation of a single linear combination derived from the envelope combination for a selected type of extreme. A Red “X” mark shown on the FE mesh of the model helps locate the position of a particular value from the Table Results in the model. The refresh of results in Table Results can be sped up via option Load Result. Table Results can be opened via a newly added Action Button directly from the Property window. A new option makes it possible to reduce the total size of the project, e.g. when sharing it with a colleague via Internet. If any tab in Table Results becomes invalid, it can be quickly regenerated using a new Regenerate Current Tab button. When performing a check of a concrete member (using the Concrete 15 menu), a detailed check can be invoked by double-clicking on the required row in Table Results. Clicking on a row in Table Results selects (and highlights) the corresponding entity in the graphical window. This feature applies to the Concrete 15 menu only. The validity status of the results for a particular tab is notified in the bottom left corner of the table.